Our free Content Update is now live and will introduce 100+ new cosmetics, Okri’s Challenges, Mod support and new ways of converting dust to the game. As a thank you to everyone who supported us, we are also giving you a login reward that can be claimed until June 2. If you’ve visited the keep lately, you might have noticed a certain book appear next to Lohner. This brand new interface, called Okri’s Challenges, is a way for you as a player to progress and earn rewards for your hard work. In Okri’s Challenges, you will be able to pick up daily Quests that will earn you new loot. If you do not have time to complete an active quest, don’t worry, they will stay there until you complete or dismiss them. Under Challenges, you will have the opportunity to really enjoy the fruits of your labour. Here Okri has been particularly hard at work by presenting you with some of the most sought-after gear in the Empire. That means if there’s a specific hero you enjoy playing, there will be plenty of ways for you to show off your hard work, adding further to the late game experience. With the new Content update, we will also introduce 100+ new cosmetics ranging from hats, skins and portrait frames. Some of these will be exclusively earned through Okri’s Challenges and some of them will only be obtainable by opening Commendations Chests. After listening to a lot of feedback from players, we have also increased the chance of obtaining cosmetics in chests. With this free Content Update, we’ve now officially launched mod support. Mods will be supported through Steam Workshop where you can subscribe to community created mods and try them out as you see fit. If you wish to learn more what this means for you as a player or aspiring modder, we how-to guide and a blog post coming out tomorrow where you can read all about it. Based on a lot of feedback from our community regarding the obtainability of a certain green dust, we have implemented a new system to convert higher tier dust to a lower tier. This means you can convert Orange to Blue dust and Blue to Green dust. When we made cosmetics, hats, and the unique items. We never thought of them as the end game. The end game we always had in mind was the same as in Vermintide 1. You get better at the game. Work your way up the difficulty rankings. That made it difficult for us to tweak the drop rate of these items. We didn't want you to feel like you're done with the game as soon as you get a couple of unique items or hats. We also didn't want these to be too common, since we frankly didn't have a lot of them. But we get it. For many of you, these cool items are your end game. They're a big part of why you play the game. 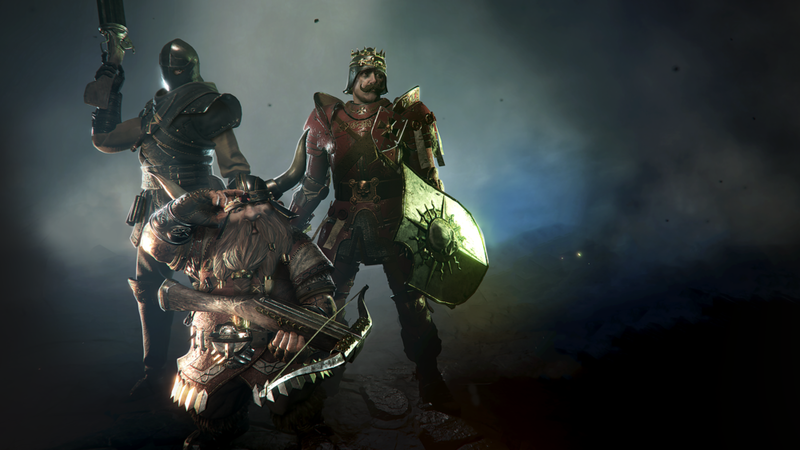 And we want to make sure everyone is having fun with Vermintide 2. In this update, we're adding a lot more hats to the Commendation Chests. And we're increasing the drop rate of all hats and Veteran items. Cosmetic hats drop from Commendation Chests, for the specific hero you have selected. We've made changes so that you won't be receiving duplicate hats. If the currently selected hero already has all available hats, a random new, unique hat will be awarded to you. There is also a small chance that a Commendation Chest will drop a Veteran item. To those of you who have been hoarding chests - you're free to open them now, we will not be changing any of the drop rates for these chests. Extracting Illusions no longer cost scrap. Applying Illusions now cost 10 Scrap. As the previous cost of extracting Illusions cost 20 Scrap, each player will be refunded 10 Scrap per Illusion in their inventory, when they log in. Added a new crafting recipe - Convert Dust. You will be able to convert Dust to a lower tier. Ten Blue Dust to ten Green Dust Or ten Orange Dust to ten Blue Dust. The confirmation delay when Crafting and Salvaging has been drastically reduced. Several Veteran items lack a distinctive textures with glowing runes. We are working on making sure all Veteran items have cool looking skins. In this version, the Veteran Swiftbows "Edrael's Will", and "Spite-Tongue" now have their proper runed textures. Fixed an issue for the Ranger Veteran Bardin's talent "Last Stand" which caused the buff to be applied whenever a clip was emptied instead of when completely out of ammo. Fixed an issue for the Battle Wizard Sienna's talent "World Aflame" where the power boost was not applied properly when playing as a client. Fixed an issue for the Witch Hunter Captain Satlzpyre's talent "Necessary Means" where the power boost was not applied properly when playing as a client, when out of ammo. Fixed an issue for the Zealot Satlzpyre's talent "Holy Crusade" where the critical strike power boost was not applied properly when playing as a client. Fixed an issue for the Shade Kerillian's talent "Bloodfletcher" where ammo would not properly be awarded on backstabs.